In the GDR, civics lessons sought to convey information about the structure of the state, the rights and obligations of GDR citizens, and the ideology of Marxism-Leninism. In all of this, spelling out the superiority of the socialist over the capitalist system was of the utmost importance. 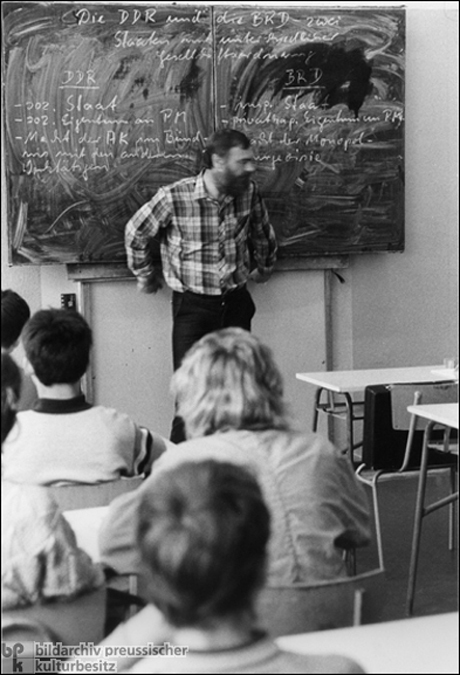 In this photograph, a 10th-grade teacher at an East Berlin school gives students his interpretation of the differences between the two systems. The heading on the blackboard reads: "The GDR and the FRG [Federal Republic of Germany] – two states with different social orders." Under the category "GDR," he has listed the following: socialist state; socialist ownership of the means of production; power of the working class in alliance with other working people. The category "FRG" includes: imperialist state; private-capitalist ownership of the means of production; power of the bourgeoisie monopoly. A contemporary civics class in West Berlin would have undoubtedly arrived at a very different interpretation. Photo by Volker Döring.